Total Score: 7.92 + INNOVATION AWARD! Introduction: At ICAST 2007, word on the floor was, Tru-Tungsten had a bait that was set to really make some noise in the big bait segment of the market. As often is the case when coming second, third, and fourth hand, details were sketchy, so once we had the time, we headed over to check this new product out. Once there, we met Matt Newman who introduced us to this promising little bait, and now, finally over a year later, here is our take on the Tru-Tungsten, Tru-Life series of big baits. Impressions: It was with eager anticipation I waited for this bait to become available and finally, earlier this year, that day came. I must have been one of the first to click through my cart to purchase the trout version of this bait online. When it arrived, well to be honest, I was a little disappointed in the bait's finish. It just wasn't as clean or as detailed as I had hoped, but nevertheless, I know it's not what I think of the finish that matters, it's what the fish think, so off we went to check out what these baits had in them. Field Tests: Though the trout was my first purchase, I ended up with both the gill and trout baits and fished both on a number of rigs my favorite being the Megabass F8-78DG Super Destruction matched up with a Daiwa Luna 253L spooled with either 20lb Trilene XL Fluorocarbon or 20lb Big Game for the 9" Trout. For the lighter gill bait, I mixed it up a bit more fishing it on everything from my Evergreen Balista to my Kistler Big Swimbait Special. The trout is available in both nine inch (shown here) and eight inch, but only one color. Casting: At one time, I found the task of tossing a five ounce bait quite the chore - not any longer. It's amazing the perspective a couple of years tossing big baits can give you. 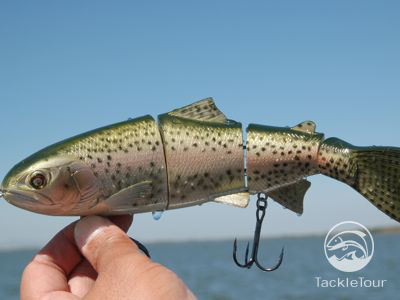 Both the nine inch trout and seven inch gill Tru-Life baits cast easily with minimal instances of fouling upon landing. As long as you are using a properly rated stick to launch these baits, there should be no issues whatsoever. The bluegill profile of Tru-Tungsten's Tru-Life swimbait measures seven inches and is available in three colors. Action: Of course, the important bit with any of the big baits is how well does do they dance once in the water. Truthfully? I wasn't too thrilled with the trout the first time I threw it. While it swims back to the boat true without rolling on its side, it has a bit of top to bottom wobble that I was not accustomed to seeing in a hardbait of this quality. 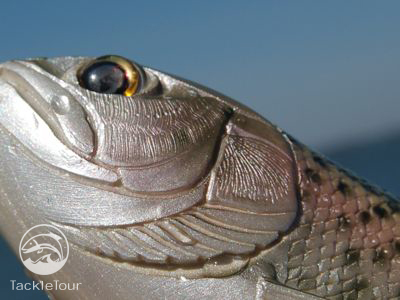 A closeup of the detailing around the trout bait's head. This motion is less evident the faster you retrieve the bait in the water and on those fast retrieves, if you jerk the bait and feed it slack, it will do a one hundred eighty degree turn, typical of other, similarly constructed baits. 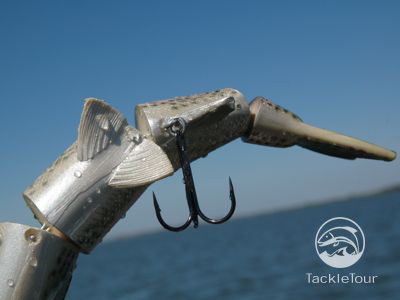 Each Tru-Life Swimbait has three joints and four body sections providing a decent range of motion. The interesting thing here is though, the more I fished this bait slow, the more its top to bottom roll grew on me. The reason being, it had a closer resemblance to a sick or injured fish laboring to swim. I fished, most of the time, with one ball in the bait's weight chamber so it swam just under the surface at this slow retrieve, and the more I experimented with this slow retrieve, the more I began to see followers coming up to take a look at this bait. Moreover, it was at this slow retrieve that I received the majority of my strikes. 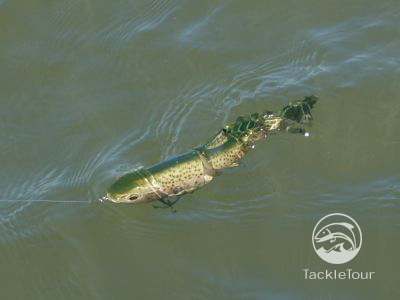 In the water, the trout has a bit of a lumbering swimming motion mimicking an injured fish. 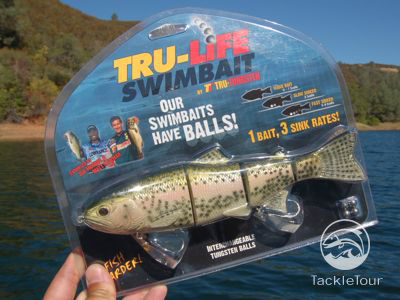 The gill version of the Tru-Life baits has the action you'd expect of a multi-piece bait. Namely a slithery, side to side swimming motion that is easily changed up with a few twitches and jerks of the rod tip. An interesting note, however, is that this bait behaved a little differently depending on how many weights you had in its belly. With no weights, the gill's action was relatively tight and unexciting. With one or two weights, just right, and I never really got to fishing it with four weights because I liked the action with two weights too much to change it up further. Conversely, the trout behaved pretty much the same no matter how many weights were in its belly. 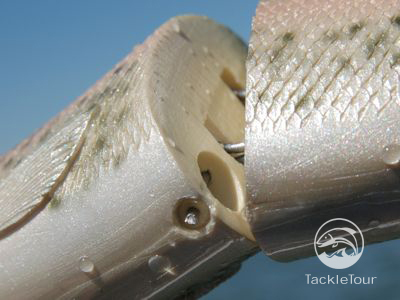 The unique feature of each Tru-Life swimbait is the opportunity to adjust their rate of fall by pulling out this pin and adding or subtracting weight. 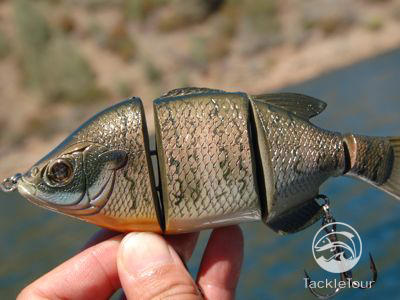 Next Section: What's unique about the Tru-Life swimbait?